February is China’s month to hold the presidency of the United Nations Security Council, a post that rotates monthly among all 15 members (making it a semi-annual position, last held by China in November 2013). Yet China had some lofty goals for this particular stint as president. 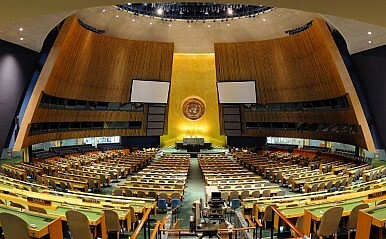 In particular, China used its position to host a larger debate about the future of the United Nations, and international relations more generally, in the 21st century. Upon taking over the presidency, China presented a concept paper for a debate that would focus on reconfirming each state’s commitment to the U.N. Charter. The discussion was also intended as a way to kick off the commemoration of the U.N.’s 70th anniversary and “the victory won in the war against fascism.” Chinese Foreign Minister Wang Yi chaired the debate, which took place Monday. Wang also used the floor to argue for China’s vision of international relations, which centers on respect for each country’s “sovereignty, independence and territorial integrity” as well as “their choice of development path and social system.” He warned against countries acting unilaterally or going outside the U.N. to impose their will on others. “We should make sure that justice, not hegemony, will prevail in the world,” Wang said. While every speaker at the debate confirmed their commitment to the U.N. charter, the debate revealed a fundamental disagreement over how that document is interpreted. The role of U.N. in dealing with state’s internal issues (notably human rights violations) has been hotly debated for decades. What’s new is that China, in keeping with its growing self-confidence on the world stage, is becoming more assertive about insisting upon its interpretation of the U.N. Charter. That includes hosting debates that provide an open stage for China to give its arguments; it also includes making use of China’s Security Council veto rather than simply abstaining. Since 2011, China has issued four vetoes (all on the Syria question, and all done jointly with Russia). That’s only one less than the five total vetoes Beijing used in the 40-year period from 1971 (when the PRC gained China’s seat on the Security Council) to 2010. Beijing has decided this year’s 70th anniversary is a good time not only to celebrate the U.N., but to reflect on ways the body can be reformed. It seems unlikely, however, that any reforms can make it through the current deadlock, as member states are divided on the fundamental issue of where the United Nations’ authority ends.